John Robbins, the son of the founder of Baskin-Robbins, grew weary of the effects of eating ice cream daily and felt destined to change his whole life style, much to the chagrin of his father, who very later in life embraced his son’s decisions. Robbins wrote a book called, “Healthy at 100” . If you haven’t read it, it is a great book that delves into healthy living styles of different cultures. The book is not so much about eating, diets, exercise as I thought it would be. It’s about the effects of changing of his life style. The whole overview of his book focuses on how you can dramatically increase your life span and your health span – at any age. That is enough to get anyone’s attention. Robbins’ discovery in a new life found that diet and exercise alone do not help people live beyond 100. “The quality of personal relationships is enormously important”. He cites medical evidence about our personal interactions, and proclaims that loneliness has more impact on our life span than smoking does. His book is about wisdom, hope, courage and common sense. And dispersed generously along the way, it is about love. And how love can save your life. I focused on a brief synopsis that Robbins uses to make a point about love. It only takes three paragraphs and three sentences on page 277 in a section called “What Matters”. Having never heard of this story before, I researched it because of its love impact and offer it to you in the ‘matter of love’. This is an old story, perhaps even a legend, although the Castle of Weinsberg exists to this day. Weinsberg is a town in the north of the German state Baden-Wurttemberg. Founded around 1200, it is noted for its wine. The town’s name is derived from the German word “Weinberg” which means vineyard. Around 1000 AD, the Weibertreu – or Wein Castle was established on a mountain trade route running from Heilbronn to Schwabisch Hall. Whether this a legend or true story, the castle was founded around 1200 and is situated in the Heilbronn district. One day in the royal court in Germany, nearly a thousand years ago, the Duke of Welf accidentally brushed the foot of the Queen when he bowed before King Konrad III. The king became so angry at this insult, that he admonished the Duke in front of the Duke’s men. Offended and embarrassed, the Duke declared he would never again pay any tribute or tax to the royal crown. Furious, he stormed out of the palace. It did not end there. In retaliation to punish the Duke, the King sent his royal army to surround the Duke’s castle. Since the castle provided home and shelter for their entire families, servants and followers, the King knew it was only a matter of time before the people trapped inside would run out of fresh food and water. Then they would have no choice but to surrender. The trapped Duke of Welf, an ancestor of Charlemagne, prepared for a long siege. He had already stored a fortune of gold and silver inside the castle, and they were well supplied with food and other provisions. The Duke planned to use secret tunnels to the city of Weinsberg to buy whatever they needed. 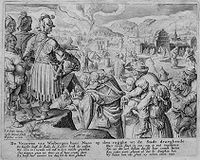 He hoped his friends in Weinsberg would send word of his plight to opponents of the King and they would bring a force of soldiers to come to their aid and rescue. King Konrad III and his troops, became impatient after a few weeks, and sent a messenger to the Duke demanding the surrender of everyone in the castle – all of the Duke’s men would have to die by the sword, but the women and children would be free to go. The Duke of Welf flatly refused these terms. Furious, the King ordered all roads and pathways surrounding the castle to be barricaded. He sent soldiers to search for tunnel entrances and when they were discovered, he filled them, blocked them, and stationed soldiers by each one. Back inside the castle, food and other provisions were quickly running out. From the top of the castle the Duke could see that soldiers guarded all the pathways. A quick inventory revealed that the stores were nearly depleted. The outlook was grim – the people inside the castle knew they faced starvation. A frustrated King Konrad III sent another message . If everyone in the castle did not surrender that very day by nightfall, he would set the entire city of Weinsberg on fire and subject all its inhabitants to the sword. The situation was desperate. We, the women of the castle, humbly realize that our fate is in your hands. We ask only that you allow us to leave at sunrise tomorrow with our children and whatever we can carry on our backs. For this we entreat you and submit our lives to your mercy. The King Konrad considered the proposal and the fact that he had pledged that he would let the women and children leave in peace. So what If they took a few pocketfuls of valuables. He would be hailed as a wonderful and merciful king. Besides, he would have the vast fortune of the Duke for his own use. He sent the messenger back with his royal approval. The next morning at sunrise, the castle gates creaked open. Out stepped the women with their children behind. But that’s not all that emerged from the castle. Carried on the backs of the women were their own husbands, while on the backs of unmarried women were their own brothers or fathers. Each woman staggered under the weight of her burden while the men, sputtering with embarrassment on the backs of their womenfolk, struggled to keep from slipping to the ground. The King found this funny and laughed but his soldiers were outraged and called for their execution. But the royal word was given and the women were allowed safe passage as well as their beloved men. According to legend, the Duke and his men were so grateful that they renewed their loyalty to the King and the King renamed the castle “The Castle of the Faithful Wives,” the name by which the castle is still known today. #Castle of Faithful Wives#German state Baden-Wurttemberg.